Whitley suffered their first league defeat since mid October as visitors Consett scored three times in the last ten minutes of a closely contested game at Hillheads. Unbeaten in seven league games and coming three days after an impressive victory in their local derby at North Shields, Whitley looked to be heading for another three points when the visitors conceded an own goal 12 minutes from time but the Steelmen turned the game on its head with a stirring finish. 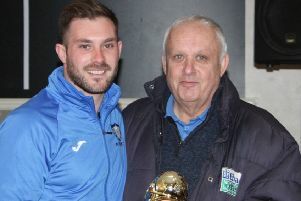 Before kick off in what was the first game to be played at Hillheads in six weeks, Whitley Bay secretary Derek Breakwell made a presentation to Alex Kempster to mark the midfielder’s 200 appearances for the club. After a quiet opening period, a quickly taken free kick by Aiden Haley to Jack Walker was played through to Matty Cornish whose shot was deflected just past the post. Two minutes later Consett’s veteran striker Michael Mackay fired a shot well over the bar for the visitors. Arjun Purewal then got a header on target but Tom Flynn saved comfortably. The game burst to life in the 27th minute when Callum Johnston broke through on goal but was brought down in the box by Consett keeper Ross Coombe, who was cautioned for the foul. Tom Potter comfortably converted the penalty, just as he had done at North Shields in midweek, sending the ball high into the top corner of the net. Six minutes later, referee Jonny Urwin allowed advantage to be played when Alex Kempster was clumsily felled in midfield but when Whitley could not capitalise and the ball went out of play, Calvin Smith became the second visiting player to be shown a yellow card. Ten minutes before the interval, Consett looked sure to score but Tom Flynn’s bravery and athleticism thwarted Michael Sweet three times with tremendous point blank diving saves. A torrential downpour shortly before the interval sent fans scurrying for shelter in the stands as a quick break out of defence saw Johnston race through and play the ball to Potter but a crucial interception ended the attack. It looked as if Whitley would retain a deserved lead at the interval but in stoppage time, Consett took advantage of the increasingly slippery surface as a low shot from skipper Danny Craggs skidded across the grass and into the corner of the net beyond the grasp of Flynn. Whitley began the second half well and within two minutes Cornish sent a header just wide of the back post from Potter’s cross. Consett then began to gain the upper hand but Thibault Charmey twice went close in Bay attacks. With 63 minutes played, he attempted an acrobatic overhead shot from 12 yards but Coombe scrambled across his goal to make a good diving save. Three minutes later the Frenchman sent a low ball across the face of goal but needing only a touch to put it in the net, there was no-one able to connect and the ball went into touch. Consett failed to capitalise on good build up play by Mackay when a shot from Craggs flew high over the bar and out of the ground. In another quick break by Whitley, a tremendous 20 yard shot from Jack Walker was superbly palmed over the bar by Coombe but the keeper fell awkwardly and was in obvious pain. After treatment he left the field with an elbow injury and with no substitute keeper available, Consett put midfielder Josh Gray in goal. There was nothing that the emergency keeper could do in the 78th minute when Alex Kempster crossed from the right and defender Ryan McKinnon attempting to put the ball behind for a corner only succeeded in sending a bullet shot into the net to put Whitley back in front. Rather than allowing their heads to drop, the visitors rallied strongly after this setback and three minutes later striker David Dowson struck a tremendous shot into the top corner of the net, leaving Flynn helpless. Two minutes later Consett stunned Whitley when Michael Sweet headed them into the lead from a right wing cross. Substitute Kyle Patton was not far from converting a free kick moments later but Consett were attacking at every opportunity, leaving Whitley unable to test the stand-in keeper. They did have one chance to level the score in the first minute of stoppage time but Scott Jasper, who had seen little of the ball since coming off the bench, delayed his shot when almost through on goal and the chance was gone. With Whitley pushing players forward in search of an equaliser, Consett broke away and sealed victory with a fourth goal deep into added time, Dowson getting his second of the game. The final scoreline was harsh on Whitley but Consett had looked the stronger side in the second half, especially in the closing stages.